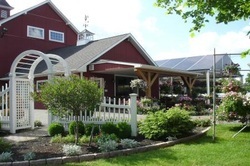 A family owned and operated farm located in the heart of Connecticut since 1922. With a tradition of quality vegetable and bedding plants, Arisco Farms supplies both wholesale and retail customers out of their own greenhouses and farm stand located on 70 acres in Cheshire, CT. This spring offers a large variety of plants, including annual and vegetable plants, hanging baskets, mixed planters, and herbs. Once summer is in full swing our farm stand will keep up with the ever changing desires of the public. One thing that never changes is quality. Our offerings will include tomatoes (our most popular), sweet corn, peppers, eggplant, string beans, different types of squash, cabbage, and cucumbers..... not to mention Fresh Baked Pies.